You’re out in the boonies camping when suddenly your flashlight battery dies: this could seriously impair your trip! But it’s just this kind of situation that Brother Industries Ltd has in mind for its new batteries, which can be recharged by shaking. In fact, the “Vibration-powered Generating Battery” can run anything that uses power sporadically and takes AA or AAA batteries! Actually, the so-called battery is a generator in a battery case, which makes it easy for you to pop it into your remote controls and flashlights. 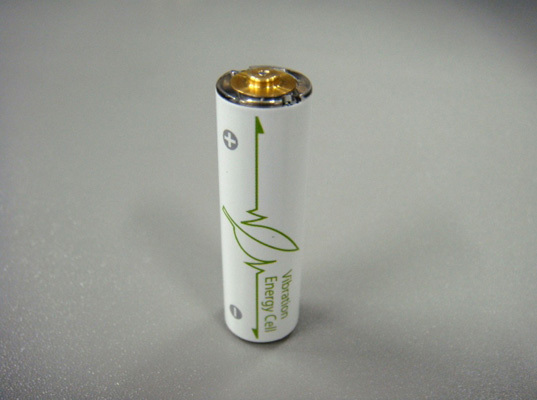 One version includes both the generator and the capacitor in the same case, and provides 1.6 volts in the AA size; another version is a pair of batteries — generator and capacitor — that provides 3.2 volts. Fewer batteries in the world, and an opportunity to convert your excess calories into something useful: I love this idea! Brother Industries is showing off its prototypes this week at the Tokyo trade show Techno-frontier. We bought an early version of a 'charge by shaking' torch - it doesn't work. Even after five minutes of vigorous shaking the dim light only lasts a few seconds. I assume the tech has moved on somewhat from that, though. I hope so, anyway! You're out in the boonies camping when suddenly your flashlight battery dies: this could seriously impair your trip! 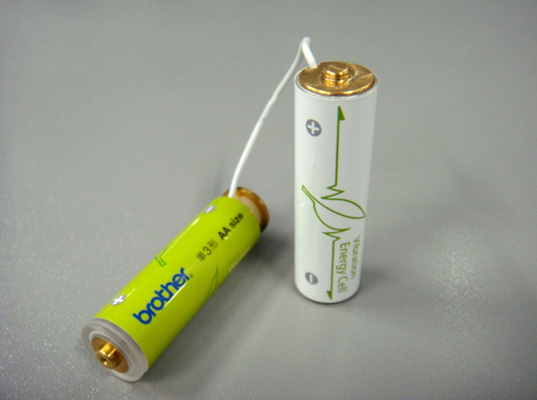 But it's just this kind of situation that Brother Industries Ltd has in mind for its new batteries, which can be recharged by shaking. In fact, the "Vibration-powered Generating Battery" can run anything that uses power sporadically and takes AA or AAA batteries!